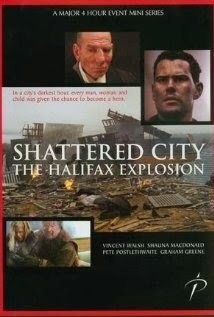 Last night I happened to catch the 2003 TV movie, Shattered City: The Halifax Explosion which is based on the 1917 explosion of a munitions ship in Halifax Harbour, Halifax, Nova Scotia, Canada. I had missed this movie the first time it came around, and caught an hour of it another time. Last night I was determined to watch it in its entirety. Twelve hours later, I’m still reeling from the death and devastation I witnessed on my wide-screen TV which cannot compare in any fashion with what actually happened on Dec 6, 1917 when a munitions ship carrying 2,300 tons of wet and dry picric acid, 200 tons of TNT, 10 tons of gun cotton and 35 tons of benzol exploded. It has been labeled as one of the biggest man-made explosions in history – second only the atomic bombing of Hiroshima and Nagasaki in WW2. The facts on what the munitions ship was carrying is real. The facts on what happened after are staggering – almost 2,000 dead, 9,000 injured, 6,000 homeless, and every building within 2.6 kilometres (1.6 miles) was destroyed or badly damaged. If you read the Wikipedia commentary on the movie, you basically see all the faults of the movie and how it wasn’t historically accurate due to the addition of a subplot and other liberalities used to make the production more of an entertainment vehicle. However, I’m not here to judge the movie, but to bring attention to the author of the book who inspired the movie in the first place. Janet Kitz, a 1980 anthropology student of Saint Mary's University, chose the event as the topic of a paper. 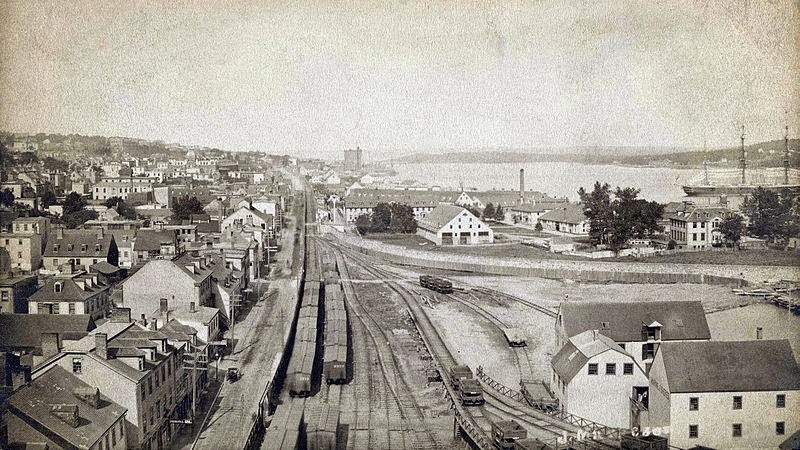 At the time, the horrific explosion was a mere tragic event in Halifax’s past without much publicity attached to it. Kitz’s research led her to a basement where small woven sacks of 1917 unclaimed personal effects called “mortuary bags” had sat undisturbed for decades. Intrigued, she delved into the research of eye-witness accounts, records, and artifacts wherever she could find them including the Halifax Relief Commission, Halifax Museum, Nova Scotia Provincial Archives, and second-hand stores. Personal stories were garnered from survivors – mere children in 1917. 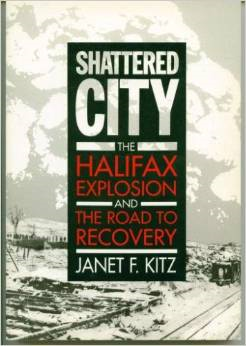 Kitz brought all the materials and interviews together into book form under the title, Shattered City: The Halifax Explosion and the Road to Recovery. Published in 1989, it sparked a new interest in the Halifax Explosion which led to the production of the TV movie. 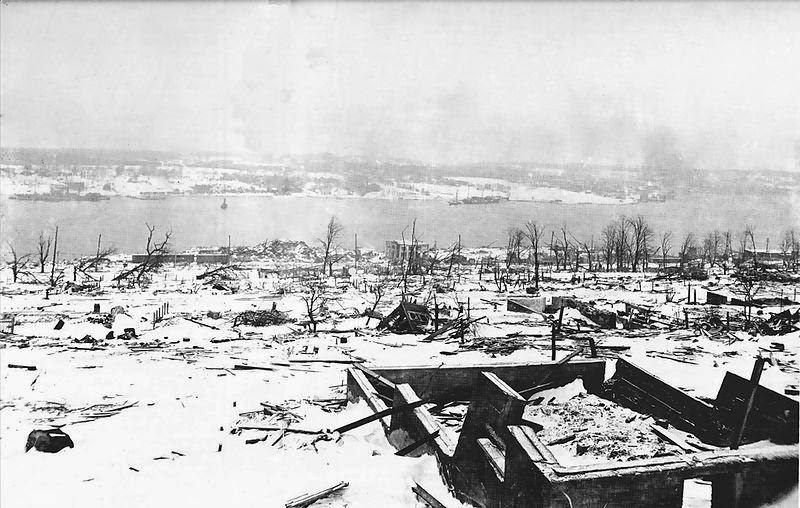 The Halifax Explosion is an in-depth website with photo and media galleries as well as a teacher’s resource section. It just goes to show you how research into one historic event can bring to light the stories of people who have been lost and forgotten, and whose stories need to be told by someone just curious enough to seek them out. Writers: Do events like this incite you to write? Readers: Do you like reading about true events mingled with fiction? I do like reading about true events mingled with fiction! When I was in Halifax a number of years ago, my friend took me to some places that had been affected by this explosion. The most memorable was a church several blocks from the harbour and it still showed signs of the explosion all these years later. Oh, that would be a powerful sight, Elaine. I've seen pictures of their Memorial Bells site but couldn't find one that wasn't copyrighted. Wow, Anita. I would be affected by watching that, too. I think it's very inspiring that Janet Kitz was moved to do all of that research. It is, isn't it. As writers, we research and dig up facts, use them, and then file them away. It takes a very special writer to spot the need to go farther and then do something about it. It never ceases to amaze me how we (Americans) know next to nothing about major events in our neighbor countries. In answer to your questions: yes to both. Even those true crime documentary usually leave me thinking about story ideas. Niki, Halifax sends a huge Christmas tree to Boston every year as a thank you for the trainload of aid and medical supplies they sent within hours of receiving the telegraph of the explosion. Because this special tree is Boston's official Christmas tree and is lit on Boston Common throughout the holiday season, not just any tree will do..."It must be an attractive balsam fir, white spruce or red spruce, 12 to 16 metres (40 to 50 ft) tall, healthy with good colour, medium to heavy density, uniform and symmetrical and easy to access." There's already a facebook page, https://www.facebook.com/HalifaxBostonChristmasTree2013 where they're speculating on the tree chosen for the 100th anniversary in 2017. 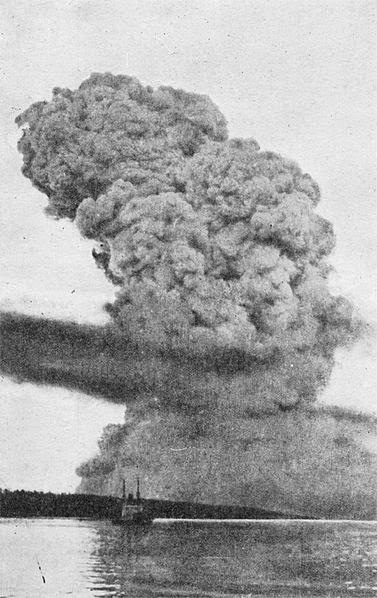 The site has many images of the explosion as well. Yes and Yes. And Anita Mae, what a fascinating story. I've never heard anything about it before. Thanks so much for sharing! Does anyone know what caused the explosion? The fire was caused when an empty Norwegian ship collided with the munitions ship. The Norwegian ship was eager to leave and was going too fast for the channel. It embedded itself 9 ft into the French munitions ship's front hold where the picric acid was stored. It may have been okay if it had stayed, but it backed out and the friction of metal on metal set off sparks which ignited in the picric acid fumes. That sent flames up to the deck where benzol had spilled out of the barrels when they were knocked down in the collision. The Halifax pilot wanted to back the ship out of the channel, scuttle the ship, or even weigh anchor and sit there, but he couldn't do anything alone on the steamship and the French crew had abandoned ship at the first sign of fire. One tug tried to move the ship, but wasn't powerful enough to pull it back. And everyone on shore could only watch as it drifted into the Halifax pier where it exploded on impact - 20 mins after first catching fire. Many of the injuries were loss of sight due to watching the flash of the explosion, or from glass flying in the eyes of those watching through windows. And yeah, my mind has been flying with ideas, too. whoa. that is quite an event. rife with potential stories. i always love reading the historical gems you find, Anita. i appreciate getting more educated about the good neighbor up North.